But ask yourself this - why would he and so many other top players spend so much time developing such an obviously illegal serve, where they have to bend their body into a pretzel, throw the ball behind their head, and do that vigorous head thrust just before contact, and then let the receiver see contact? Here's the key rule on hidden serves - I've bolded the key parts. Here's the still image just before contact. Note how the ball is next to his ear, with his racket directly behind it. Here's the very next frame, where he's contacting the ball. Juggle between the two, and note how his head has dropped down in the second frame to keep contact behind his chin. Note that in the first frame, the ball has just gotten behind Ma's head. With the ball moving toward Ma, and his head thrusting it out, it continues to even more behind his head. I've played and coached against players with Ma Long type serves and know contact wasn't visible - that's the whole point of this behind-the-head serve motion, that it hides the ball until just after the split second of contact, while making it difficult for umpires to know for sure, especially with the racket following the ball downward and forward. I've watched players practice these serves and coaches teaching it to them. Just last year I played a kid who was about 12 but had already perfected the Ma Long serve. I never saw contact. I complained, to no avail. And so I had to return the serves defensively or be erratic, and lost to a much weaker player. The idea that our sport has reached the point where our coaches are teaching such openly illegal serves to 12-year-olds sickens me - and yet it makes perfect sense as we allow this type of cheating in our sport. Too many of us are in denial - first saying the serve can't be illegal, then saying, well, maybe it's illegal, but contact is visible, while ignoring both the video evidence and the logic of why players develop such intricate serves designed to hide contact and then supposedly choose to allow the opponent to see contact. We are living in bizarro land. There is a legitimate debate over whether an individual umpire should call these serves. They are illegal, but the problem is whether you want one umpire calling them, while the rest are not. This leads to inconsistent umpiring. What should happen is all of these serves are called, and then the players would stop using them. But alas, we are in a situation where few umpires call them, and so players use them, either to gain an advantage or to nullify the opponent's advantage since so many opponents are hiding their serves. But there is no legitimate debate over whether illegal serving is widespread. We can see it with our eyes. Just watch the video, and those of other elite players. I'm wondering if we are the only Olympic sport that allows such open cheating? And before you object, of course it's cheating, by definition - to "act dishonestly or unfairly in order to gain an advantage." There is an argument that if both players are doing it, then it is not cheating since neither is doing it to gain an advantage - they are doing it so their opponent doesn't get an advantage. But not all players hide their serves, and so when they do so against an opponent who doesn't, they are cheating. Whoever does it first in a match is also cheating. There's a simple way of looking at this - if both players played by rules unless the other play didn't, then both would play by the rules. Wouldn't that be great? It's sort of like a 100-meter race at the Olympics where one player steps forward two meters, the race officials allow it, so another follows, and pretty soon nearly all of them have stepped forward those two meters, while arguing that it's not cheating since the others are doing it. But what about the ones who don't, who stay back? And do we really want to turn the 100-meter race into a 98-meter race? But the race officials don't want to be the bad guys who call out the players for breaking the rules, and so they allow the players that two-meter head start, if they choose, and pretend all is fine. One argument I've often heard is that umpires shouldn't call a hidden serve because it affects the course of the match, especially when it's close. But why should this affect anything? Umpires should call the serve as the rules specify, regardless of how it affects things or the score. (I'm putting aside the "consistency" argument here, for now.) I know this is not always easy, but that's part of the job of being an umpire. I greatly appreciate baseball umpires who take so much flack while trying to do their best, and I similarly respect table tennis umpires who do the same. But again, there is that problem of whether to be the only one calling these illegal serves. Some argue that if we were "strict" about enforcing the service rule, then we'd be faulting just about every serve. I strongly disagree - just for example, my serves are all legal, and so are many others. (I've never been faulted for serving illegally in my entire career, in hundreds and hundreds of tournaments.) But there's also a distinct difference between the effectiveness of different illegal serves. Comparing the problem of someone doing a five-inch toss instead of six, to a hidden serve is apples and oranges. There's a MUCH bigger advantage to hiding contact than from having a slightly short toss. We need to focus on the illegal serves that have a big impact. That doesn't mean players shouldn't be faulted for more minor serve problems such as a five-inch toss, but that's simply not a big issue, at least at the higher levels. Hidden serves is the elephant in the room. But why don't more top players complain? Three main reasons. First, many have, but they have long learned that complaining about it is pointless, and so they are forced to simply learn to return these illegal serves, reading the spin from how the ball travels through the air and bounces on the table, which is much more difficult than reading it from contact, and leads to more mistakes or less effective returns. Second, most top players have long ago realized they too have to hide their serves if they don't want to give their opponent an advantage, so most of them hide their own serves, either regularly or semi-regularly, and so it would be hypocritical to complain at this point about the opponent. And third, hidden serves are one of the big dividing lines between top players and almost-top players. The established players are used to hidden serves, the up-and-coming ones less so, and so by allowing hidden serves, top players more easily beat these up-and-comers. I've also heard some say that if the umpire doesn't call the serve, then the serve is legal. That's nonsense - it's just rationalizing the fact that they got away with breaking the rules, and the serve is still illegal. It's like saying a burglar isn't committing a crime unless he gets caught. However, there is a legitimate argument that it's okay to serve illegally if the umpire doesn't call it (at least at the higher levels), since doing so is widespread among top players and so up-and-coming players have to learn to do this to compete. Many would disagree with this argument. I'm not happy with this situation, but it's an inconvenient truth. So, by definition, if the umpire can't tell that the serve is legal (i.e. not hidden), then the serve is illegal. And yes, it's easy to do a forehand serve where the umpire can see this - it's how I serve, as well as Samsonov and others. But few umpires apply this rule, and instead go by the dictum that if they aren't sure the serve is hidden, then they don't call it. And so players have learned to serve so contact is hidden, but not so blatantly that the umpire will call it. The part that's harder to figure out is why they don't call a serve that goes behind the head, which is so blatantly illegal - the ball must be visible to the receiver from the time it leaves the serving hand. But that's usually rationalized with the idea that even though the ball is (illegally) hidden, contact is all that counts, which of course isn't what the rules say. And once given that, players can then get away with hiding serve after serve. Ironically many players who hide their serve don't do it nearly every time, like Ma Long does. Some pick and choose when to do so, usually doing it at key times. The reason is that if you hide it all the time, then opponents get used to it, and so focus on reading the ball as it travels through the air and bounces on the table. But if you let them see contact much of the time, then when you suddenly hide one, they miss it badly. Also, even players like Ma Long will use serves where contact is visible, such as his occasional backhand serve, because while these serves aren't as effective if used regularly, if used sparingly the variation is effective since it takes time to adjust to any good serve. Note that a good hidden serve isn't one where all one does is hide contact. The top players who hide their serve not only hide contact, but they try to fake a different spin. For example, they may serve sidespin or no-spin, with contact hidden, then follow through vigorously down to fake backspin. A good hidden serve looks like one type of spin from what the racket is doing before and after contact, but does something different at contact. How did we get to this situation where top players regularly hide the serve and get away with it? The "short" answer is this. When the hidden serve ban first came about in 2002, it was mostly enforced and most players stopped hiding their serves. Then, a few top players discovered that if they did borderline serves in a way that the umpire wasn't sure whether it was hidden or not, most umpires wouldn't call it, though a few did. I believe Wang Hao was one of the first big stars to hide his serve consistently and get away with it. Umpires didn't want to be the "bad guy" and call such serves when they weren't sure if they were actually hidden, even though the rules say they should - it's human nature to want to be sure before calling such serves. It started with a just a few players. But when umpires didn't call them for it, others started to do it. Since other umpires weren't calling them, and with the argument of being consistent with other umpires, they didn't call them either, and pretty soon it became commonplace. So players found ways to hid contact where the umpire wasn't sure. Some would get called for hiding it with their body, shoulder, or arm, but then the Chinese discovered that throwing it behind their head was more subtle and less likely to be called. I believe it was in the early 2010's that this type of serve started to came out. It was in 2012 (the Olympic year) that I first noted the emergence of this style of serve. Several U.S. players who trained in China before 2012 copied the serve and told me that an entire generation of players were now using it there. In contrast, some note how USA's Wang Chen has been faulted a number of times for her hidden serves, but that's because she more openly hides it with her arm rather than develop these more subtle methods. Some still hide the ball with the arm, shoulder, or body, but more and more the behind-the-head method is dominating. Note that another reason umpires are hesitant to call such serves is because, as shown in this very discussion here, many spectators are fooled by the server into thinking the serve is not hidden, or at least contact is not hidden, and so object to them being faulted. Umpires, being human, realize this and so are less likely to call such seemingly borderline serves. The saddest part of all this is that coaches at some point have to give up-and-coming kids (and often their parents), "the talk," where they explain that many of their kid's opponents are going to hide their serve, and so if he wants to compete on an even level, he has to as well. Or he can train and train and lose to weaker players who do. Yes, an inconvenient truth until ITTF or someone solves the problem. A few years ago I made a proposal on this, the Net Visibility Rule. I sent it to the ITTF Athletes Commission (then chaired by Samsonov), but alas, nothing has come of it. (They are looking into it, but Samsonov said they are facing bureacracy - and he's no longer chair. Saive is the new chair, but I haven't contacted him.) I've also tried to get the USATT board of directors to take action, first by asking our umpires and referees to enforce the rule, and then by sending a letter to the ITTF asking them to prioritize this issue. The first attempt lost 1-6-1 (I was the only one in favor) as they didn't want to penalize our players. The second was also rejected as they thought my proposed letter would insult umpires by insinuating they weren't enforcing the rules, and so set up a three-person commission to rewrite it. That was on June 20, exactly two months ago, and we haven't heard back from the yet. Here's the write-up, photos, and video from the tournament I ran this past weekend! It had a powerful draw, with seven players over 2550, eight over 2500. The Open final was Sharon Alguetti over brother Gal Alquetti. Here's the home page for the Bulgarian Open, which finished yesterday, with complete results, articles, pictures, and video. Here's an interview (2:05) with Liam Pitchford, who upset Ma Long at the tournament. Here's video of the match (13:43), with time between points taken out. Here's the ITTF article. Here's the article by Eli Baraty, where he analyzes the match. Here's the article and video (2:27). The Game is Changing: Say No to Waist Rotation - two videos, 2:17 and 2:35. Training Videos! - Three videos, 25 sec, 49 sec, 7:31. Here's the article from Changing the Game Project. Can Engineers Play Table Tennis? I usually avoid equipment articles here, as I have a conflict in interest - I'm sponsored by Butterfly - but these seemed interesting about the equipment of the 15-year-old Japanese whiz kid, #6 in the world. (I use Tenergy 05 on forehand, Tenergy 25 on backhand.) Here are the four articles. Here's the issue from last week. Here's the article by Steve Hopkins on this club in Saint Augustine, Florida. Here's the article by Han Xiao, former long-time U.S. Men's Team member, 4-time U.S. Men's Doubles Champion, and one-time U.S. Men's Singles Finalist. Here's the video (7:07), from Arnaud Scheen. Here's the video (3:23) of the 15-year-old whiz kid from Japan, now #6 in the world. Here's the video (2:16) from the BBC. Here's the video (1:36) from Fox 5 News. "Don't let her smile fool you. Estee Ackerman is a self-proclaimed pingpong prodigy. She has been playing for more than half her life." Esteen and I are both normally sponge players, but we won Hardbat Mixed Doubles at the Nationals last year! Here's the video (34 sec). Former world #1 Samsonov of Belarus is down to #54 in the world, but was #8 last year. Robinot of France is world #96, was #65 last year. Here's the article from the Korea Herald, which features Hyun Jung-hwa. "Decades later, South Koreans still remember shedding silent tears as they watched a South Korean table tennis player stroke her North Korean teammate’s face before pulling her into a gentle hug -- right before the disbandment of the first inter-Korean sports team in history." Here’s chapter 13 of Tim Boggan's latest volume, which covers 1993-1994. Or you can buy it and previous (and future) volumes at www.timboggantabletennis.com. This chapter covers "Tournaments Abroad." Volume 21 is 438 pages with 1667 graphics, and covers all the wild things that happened in 1994-95 - and I'm mentioned a lot! Why not buy a copy - or the entire set at a discount? Tim sells them directly, so when you order them, you get it autographed - order your copy now! Here's the video (28 sec)! Minions playing table tennis with lots of volleying (15 sec)! I've posted links to past videos and pictures. Below is my current lost, including this one. Minions playing table tennis with lots of volleying (15 sec). Video of Minions playing table tennis (10 sec). Repeating Gif Image of Minions playing (we should put this up on every club's webpage!). Here's my coaching analysis (midway through the blog). I have three new stories out! My story "The Plaything on the Tesseract Wall" is in the new issue of Analog Science Fiction. My story "Satan's Soul" is out in Galaxy's Edge. And my story "An American Christian at the Pearly Gates" is out in Alternative Theologies: Parables for a Modern World, a new anthology that satirizes bad religion. Meanwhile, I've started a new science fiction novel, but am still mostly in the research and planning stage. Here's my science fiction & fantasy page, which includes my blog and bibliography. I plan to put up a new blog entry there today or tomorrow. Another reason is harder to explain to non-fiction writers, but I'll try. When I write science fiction, especially novels that take many months to complete, I have to get completely immersed in it. Even little distractions take my mind off it, and then I'm done for the day as far as SF writing. So I'm trying to remove as many such distractions as possible. If I don't do this, I won't write SF nearly as much or as well, and someday I'll look back and regret it. So I'll be blogging now every MONDAY morning, along with a Tip of the Week. I'm not 100% set on Mondays; I'm toying with doing it on Fridays instead. If anyone has any suggestions on the best day for this, comment below. My private coaching is currently on hold due to my ongoing shoulder problems, and I don't know if I'll start that up again. I will continue with group sessions. As readers know, I've had shoulder problems all year, and after lots and lots of physical therapy, mostly to loosen the muscles around the actual injury, I now have looser (though still tight) muscles, but the shoulder still isn't healed - many movements are still painful. Doctors say this type of injury can take anywhere from six months to two years to completely heal. Their main focus has been on loosening the muscles that were pulling on it, though it's still not 100% certain what the specific problem is, though it's likely the slightly shredded rotator cuff, along with tendinitis and bursitis. As to my science fiction writing, in September I have a short story coming out in Analog, the largest circulation science fiction magazine in the English language (I think there's one in Chinese that's larger), and a number of others. Mike Resnick, the editor of Galaxy's Edge Magazine (one of the big "pro" magazines that's bought 14 of my short stories) and who as a writer holds the record of 37 Hugo and Nebula award nominations (the annual SF awards), wrote to me recently saying, "Don't let this go to your head...but you're too good -not- to make a living as a [SF] writer." When I told him I was now working on a new SF novel, he wrote, "OK, you get to live." My SF writing career has been taking off - I now have four novels and 92 short stories sold. Here's my bibliography. Where should you go for your regular table tennis news, including coaching? Here is a selection of pages that have regular news items that often focus on coaching. And here's the Ping-Pong Kid (3:03) - Nick Rudd - doing ping-pong tricks! Now the really bad news. I was out of town recently for 3.5 weeks (World Veterans and Nationals), and Thursday I'm going out of town again! I'll be away July 19-29, and so won't be blogging during that time. (I'm off to my annual science fiction writing workshop vacation in Manchester, NH.) After this I hopefully won't be missing any more days for a while. Follow Through Back Into Position After Forehand Looping. Here's the video (91 min) of this challenge match that took place at the U.S. Nationals, on Saturday, July 7 at 1:30PM, with Adam Bobrow commentating. I'm sitting next to him, and occasionally comment to him. Initially the match was to be on one of the feature stadium tables, but with the tournament almost over tables were being taken down and moved into trucks, and the opening for the trucks meant that one side was looking into a glare. So they moved to another table. At 10:40 you can see the $10,000 cash. The match itself starts about 11 minutes in. The challenge was initiated by A.J., and agreed to by Jim. The deal - best of seven to 21 - yes, you read that right! - with each putting up $5000 in cash. A.J. has dominated the U.S. hardbat world the last few years, while Jim dominated it for a number of years before that. SPOILER ALERT! - Jim wins the match, 4-2: 15,-16,7,11,-15,19. There were two key turning points. Jim goes up 3-1 in games, winning the last two games at 7 and 11, and is up 15-9 in the fifth, seemingly coasting toward an easy 4-1 win. They are having great points, with A.J. both counter-hitting and chopping, but with Jim winning most of the long points. But incredibly, A.J. scores 12 in a row (!) to win 21-15! Jim quite visibly was tired during this run - if A.J. can turn it into a physical fitness contest, he can win. Jim is up 13-9 in the sixth, then he's down 14-15 - again, looking physical tired - and then is up 20-16 match point - yeah, lots of back and forth runs of points this match. A.J. scores three in a row before losing the final game, 21-19. Overall: He has very good serves that allow him to take control of the point, with the ball tossed behind his head like many world-class players, but hidden serves are rarely called these days. (To see this, watch the serve when Jim's on the far side of the table. Ma Long, Fan Zhendong, and others do the same thing.) He comes at you from both wings with relentless drives, rarely missing, with an occasional backhand smash. He almost never backs up or chops. Except when he tires, it's simply hard to find a way to score against his relentless consistency. Strengths: Great serves, rarely misses except when tired, keeps coming at you from both wings with strong drives, the threat of the big backhand, experienced and cool under pressure. Weaknesses: Lack of forehand finishing shot, not as dominant on backhand as expected, and at key times toward the end had stamina problems. Overall: Equally comfortable countering or attacking, or chopping. Strengths: All-around play, very physical, great footwork, and sometimes able to run off strings of points in a row. Weaknesses: No real weaknesses, though like Jim often focuses on consistency and so doesn't end the point as well as he could with smashes - I thought he should have smashed more on the forehand side. Doesn't have a specific overwhelming strength (except perhaps his fast footwork), other than ability to do EVERYTHING well. Last Thursday (July 12) was my first blog after being out of town for 3.5 weeks, and it was loaded with links to blogs and articles by some of our regular table tennis writers and videographers, including Samson Dubina, Tom Lodziak, Eli Baraty, Jon Gustavson, Shashin Shodhan, Emratthich, and PingSkills. Why not browse over some of the ones you didn't get to yet? Maryland Table Tennis Center Featured! Here are three new articles or videos that feature my club, MDTTC, or its players! Here's the article by Bill Draper that features 96-year-old Mel Ketchel - a regular player at MDTTC, World War 2 veteran, and with a PhD in Physiology, was a professor at Tufts. Here's the video (5:12) from PingSkills. Here's the video (4:15) from Eli Baraty. Here's the video (3:26). I think they mean "Turning." Here's the ITTF home page for the event, July 19-22 in Daejeon, South Korea. The USA Junior Team won six of the seven gold medals! Here's the USATT news page, with lots of articles on this and other topics. Here's the ITTF Pan Am Juniors page, with results, articles, pictures, and video. Here's the article by Matt Hetherington on Team USA sweeping Girls' and Boys' Teams at the Pan Am Junior Championships. Here's the video (6:40) of them taking the podium. Here's the ITTF article, United States asserts authority, status justified. Singles and Doubles start next. 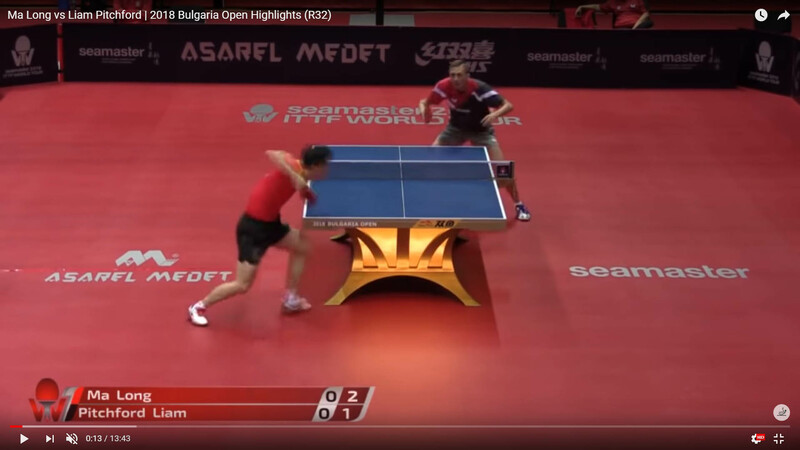 Here's the video (9:39) featuring Matt Hetherington, who is also USATT's Media & Communications Director, and one of the hardest-working people in table tennis! Here's the ITTF article, and another from the Croatia News. Reading this was sort of a "wow!" moment for me as Surbek was the first top international player I ever met - sort of. At the 1976 U.S. Open in Philadelphia, my first big tournament, I went out to lunch and sat at the counter at some diner. In walks the Yugoslavian stars, world #3 Surbek and Milivoj Karakasevic (father of future star Aleksandar). There were only two open seats - one on either side of me. So Surbek sits to my left, Milivoj to my right, and they spent the whole meal leaning back and talking to each other in one of the languages of Yugoslavia, while I sat frozen in awe. Surbek went on to win the tournament. Jin Ueda's Backspin Touch is NEXT LEVEL! Here's the video (17 sec). (Jin is world #26 from Japan.) Many players think that short pushes have little backspin, but world-class players put surprisingly amounts of backspin on the ball when they push short. It's that very grazing motion that creates the backspin that also gives them touch, since grazing the ball puts little forward motion on the ball, and that, along with the backspin, keep the ball short. Here's the video (6:02), in Chinese but the demos are good. Here's the video (14 sec)! I presume the drill forces the player to react quickly to the incoming ball. Here's the video (8:25) showing how plastic balls are made. Here it is! Five new members of the USATT Hall of Fame were inducted at the Hall of Fame banquet during the U.S. Nationals. Each of them will eventually have their own Hall of Fame profile. Dhiren's was written by Paul Lewis, and is the first of the profiles not written by Tim Boggan. Here's the ITTF article. Others inducted were Aili Elliott (Li Ai), Henan Li Ai, Dhiren Narotam, and Norman Bass Jr., plus the Lifetime Achievement Award to yours truly. Here's the ITTF article on the world #39, Andrej Gacina. Here's the video (6:21) by Adam Bobrow on the world #18 from Sweden. Here's the article featuring Carol Klenfner. "Dear Friends and Family, I am honored to be a member of the U.S. Para Table Tennis Team with hopes of representing Team USA in the 2020 Paralympics in Tokyo, Japan. Many of you have supported my table tennis endeavors over the past several years and I hope you will continue your support throughout the remainder of the Paralympic Quadrennium. "My Paralympic journey started well before I began playing table tennis. l was born with pseudo-achondroplasia, a type of dwarfism characterized by shortness of limbs and orthopedic issues related to bone and joint development. As a result, I encounter severe pain in my knees and hips. But at the same time, it is my physical disability that allows me to pursue my ultimate goal of going to the Paralympics." Here’s chapter 8 of Tim Boggan's latest volume, which covers 1993-1994. Or you can buy it and previous (and future) volumes at www.timboggantabletennis.com. Chapter 8 covers "1994 International Play." Volume 21 is 438 pages with 1667 graphics, and covers all the wild things that happened in 1994-95 - and I'm mentioned a lot! Why not buy a copy - or the entire set at a discount? Tim sells them directly, so when you order them, you get it autographed - order your copy now! Here's the video (34 sec)!